This particular sheet covers Spitfire Vs from the mid-war period and each is the mount of either an American Eagle Squadron pilot or an ace. 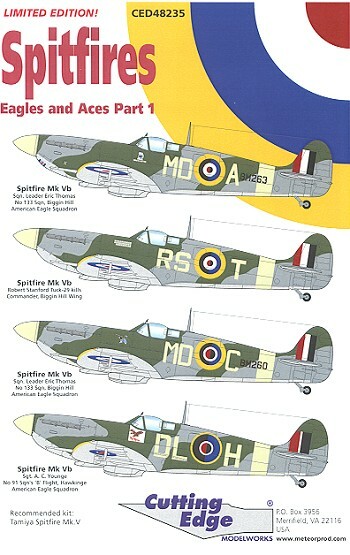 Though the Tamiya Spitfire V is recommended, there is no lack of Spit V kits with Hasegawa and Airfix being ones that come readily to mind as possible alternatives. All the planes are in the Dark Green/Ocean Grey over Medium Sea Grey scheme with yellow leading edges and Sky on the spinner and fuselage band. 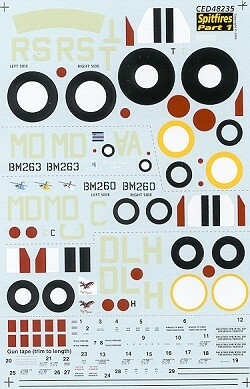 The sheet realistically provides complete markings for just one aircraft, though if you did away with the data markings, got the roundels you need from another source and painted on the Sky fuselage band you could do multiples from this one source. You may also notice that the roundels on the instruction sheet are segmented with odd colors. I've seen this before and it is just a printer's glitch and does not reflect the actual colors on the decal sheet. Next is the mount of Ace Robert Stanfort-Tuck who was in command of the Biggin Hill Wing in early 1942. Another 133 Sq aircraft and another mount of Eric Thomas is this aircraft from early 1942. Finally, Sgt. AC Younge's plane from 91 Sq at Hawkinge during the summer of '42. All these planes are Spitfire Vb variants. If you would like your product reviewed fairly and quickly by a site that averages over 250,000 visits a month, please contact me or see other details in the Note to Contributors.